You could use this threat to request to community some pictures you would like to see. I'd like to see a couple of Eureka miniatures I'm looking at for my high elves... Especially for scale purposes! I just put some charts, and carraiges. Is that the sort of thing you have in mind for a baggage? Never heard about it. I know that scotia grendel could expand to 10mm range. Baggage train seems to have good figures though! They defenetively have the sculpt style of pendraken. As they are stripped then I though they came from Kallistra. As far as I know Paul from Kallistra and Dave from Pendraken went to the school together or at least they knew each other for long time ago. When Paul kick off Kallistra, Dave lend him the fantasy range. Kallistra stripped the figures and make some slightly conversions. As fantasy pendraken are 10-11mm Kallistra figures were slighter bigger than 10mm. 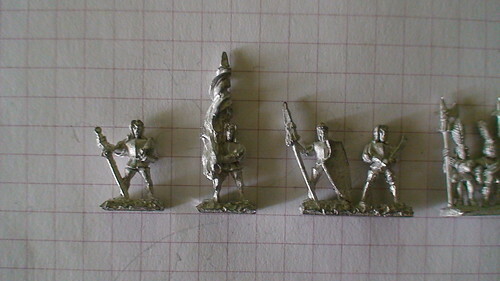 And when starts his historic range kallistra follow the same size (I think reaching the 12mm). Kallistra has realesed a lot of figures and I did not follow his evolution too much, so I do not really know the size of the figure realeased in the last years. Hi calmacil. All the figures on the pic is the whole Kallistra command blister? do you mind if I use it for the catalogue?